Every few weeks, or at least with mind-boggling rapidity, a publication decides it has hit upon a great new idea to solve housing support issues for disabled adults, including those with mental health disabilities. They run a piece about nature-based farmstead “communities” of disabled people and staff who support them, and the “therapeutic” values of said farmsteads. They describe them often as a positive alternative to institutions, but these settings fail to qualify as alternatives to institutions. They are institutions. The idea that nature-based, isolated settings benefit mental health is popular today. For context, I define nature-based care as “sending disabled people off to rural areas to be in the quiet aura of the country so that their mental health and/or other disabilities heal,” also historically known as “institutionalization,” regardless of whether the people wanted to go there.The articles and their authors fail to mention that these farmsteads are institutions that segregate and trap people on farms. And disturbingly, many of these publications and the authors of those pieces seem to not realize what history is behind the idea of farmsteads for disabled people. State institutions for people with disabilities have had a tendency to be in rural and nature-based areas. Many people, including those in government have relegated – starting in about the 1850s – developmentally disabled people to rural areas. Unfortunately, people are still trying. They used to be called “farm colonies” and “institutions,” and now they’re called “farmsteads” and “intentional communities.” Evidence for the historical relegation of developmentally disabled people to institutional settings in the country can be found in Table 1 of “The Illusion of Inclusion: Geographies of the Lives of People with Developmental Disabilities in the United States” by Pamela Walker and Deborah Metzel. 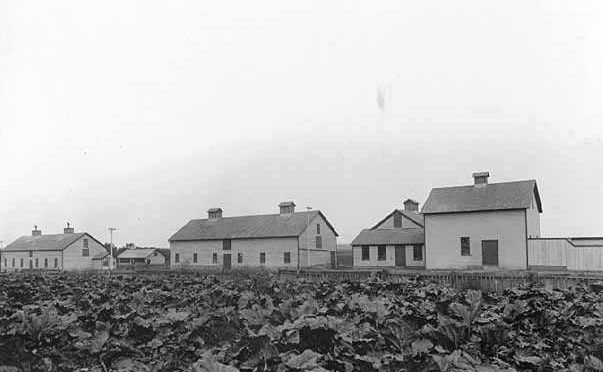 The farm colony, an institutional satellite agricultural operation whose purpose was to “… provide suitable homes and employment to the boys, and secondly to supply the home institution with fresh food” began in the 1880s. The articles supporting farmsteads fail to acknowledge this history. Disabled people themselves do not ever seem to be the authors. For example, these pieces are such as this Rolling Stone article on autistic adults, and this Vice article on people with mental health disabilities were both written by people who are not disabled. For disabled people, the prospect of institutionalization – which for many, is one gap in a precarious system of supports away – is not something met with glowing praise. It is something met with fear, with anger, with the knowledge that people go into institutions and never leave, that people die in institutions. Even if death is not the fate of someone being institutionalized, there is an utter loss of control and autonomy. Service providers in institutional settings maximize efficiency at the price of quality, individualized, and community-based care. It doesn’t matter whether the institution is a farmstead, nursing home, state hospital, or private institution. These farmsteads are not real community. They are institutions. It is irresponsible to say that a farmstead, populated mostly, if not entirely, by disabled people and their support staff is “community-based” and “intentional,” especially given that a lot of the disabled people don’t get to make that decision for themselves about living there. We know that scattered site housing works for disabled people with high support needs and those with developmental disabilities, despite the many myths. We know that supportive housing can help vulnerable people, such as those with mental health disabilities, live and thrive in the community. Maybe it takes this supportive housing as well as supported decision-making. But it is doable. It is a right. We have already tried segregating people in institutions and the farms on those institutions. Parents need to stop trying to do that now. When I was a teenager I worked at a farm that taught teenagers and youth with challenges how to dairy farm. While the young people did live on the farm, once they graduated from the program, they were sent to work on dairy farms in other communities. It was a requirement of those dairy farmers receiving this help that they provide suitable housing and supportive care. After reading this, I wonder if those youth, the majority of whom would have been classified as disabled were there of their own choice and what kind of life we sent them into as a result of this program. We thought we were giving them independence and the ability to belong in a community. We thought that by teaching them skills they would be able to achieve a level of independence. Now I am wondering if we didn’t just train up modern day slaves. Now I wonder how much they were paid for the work they did and how good their supportive care really was. In hindsight it appears that we may have sent them into very vulnerable situations. I wasn’t part of the transition process so I don’t know how much supervision or choice they had but I hope somebody on that end was checking up on them at least. I was only on the teaching end and I must say that I loved working with those teams. We were proud of our accomplishments, creative and very productive. It was the 1970/80 so I truly hope we have come a lot further on our acceptance and understanding since then. I remember reading about a young man in Ireland who was institutionalised in one of these “farm communities” after a dispute over his living arrangements and medication. He wasn’t there voluntarily and complained about being forced to undertake unpleasant farm work such as that involving manure. I wonder how much of that kind of work is done by the disabled inmates and how much of the engaging work is done by non-disabled workers. When will we realize that it is actually quite straightforward: people with disabilities want to live where and with whom they choose (just like everyone else in society). It’s our job as citizens to figure out how to create the supports that will make that happen. There is a neurodiverse population that wants to live in intentional community. I just presented at a conference called AutHaven which was created and run by autistics who now want to create their own rural intentional community / farmstead. It is important to recognize the HUGE difference the service delivery models makes: Many of the intentional communities being developed today are consumer-controlled which means the person with the disability controls their home instead of a provider and they can change providers at any time. Provider-controlled settings like foster care or group homes “in the community” are more institutional in nature than any consumer-controlled setting because the person with the disability can be required to leave at any time and can not switch providers. Today, 70% of people with disabilities are victims of abuse, over half report feeling isolated, access to housing vouchers is nearly impossible, and only 10% of people with developmental disabilities in the USA can access residential support to live in their own home. Something must be done and not everyone wants to live in scattered-site housing! Institutionalization is a product of mindset and service delivery structure… Not bricks and mortar. Instead of bashing other peoples preferred home and community choice, we should be working together to make sure people actually have access to a variety of options and don’t get pigeonholed in the next empty bed or forced to live with family which is the situation now! They aren’t talking about community choice. Even I sometimes wish there were nice places for autistics to live in peace and (this is key) also be free to leave and move to different places if they want to, kind of like an Elvenhome for autistics or something like that. That type of place is not what the article is referring to. It is referring to euphemistically named places that don’t seek the input of autistics and don’t give them autonomy, but rather function like institutions with a pretty facade. If the places you are referring to are not what is being discussed in the article, great! This article is not talking about your intentional community. It is talking about a long and ugly history of putting a pretty, nature-filled veneer over places designed in actuality to warehouse, entrap, and, at worst, even enslave disabled people – even the Judge Rotenberg center does that in a way, albeit with lavish (if tasteless and often creepy) artwork and a (garish) reward center tricked out with all sorts of games instead of nature; and yes, apparently they too have contracted out the labor of disabled people. If we are to have something like an actual intentional community for autistic people that isn’t an institution, it HAS to be run by autistic people, for autistic people, and it has to allow autonomy. At the very least, it should pass the burrito test, which Dave Hingsburger developed to tell you whether the place you live in is an institution, which goes as follows; if you are unable to microwave a burrito in the middle of the night because of the restrictions of the community itself, you are living in an institution. And also the place should allow you to have full contact with the outside and complain about the community as much as you want (including whining on Facebook) without getting in trouble. That is key too. And no, whining isn’t pleasant or polite, but it should not be forbidden outright. That is the point. The “farm” I worked at for 6 years self proclaimed to be World Renouned. Their brochures bragged that the individuals benefited from the planting, nurturing, growing, harvesting, eating and selling of the crops. In actuality the folks had little to no choice in their daily work. Their groups where organized mainly on the staffing patterns needed to support each group. They also boasted they had the necessary keys to assist Autistic individuals and had week long seminars to teach other agencies the secret of their success. Again in all actuality they did none of the “world famous” teaching. Folks were housed institutionally with very few choices and very little interaction with the community. The farms idea of being a part of the community was going to the carryout once every couple of weeks to buy a pop or the ever popular institutional ride in the van. This particular “farm” was known to the community as the place to buy all of your Spring flowers especially for Mother’s Day. I knew it was time to leave after many attempts to change the system when I saw them buy flowers from the local Wal-Mart, take them out of the containers and claimed the participants had grown them. There is no meaningful work, no choice and no way out. They pass the Medicaid surveys because the surveyors are blown away by the baby goats and happy to be out of the office. The folks that have severe challenges are dropped from the program but never because the “farm” wasn’t doing their job. They would make the parents, relatives or guardians believe it was their fault. The farm setting indeed is an institution, no doubt about and should not be allowed to continue. I know first hand and also know it doesn’t have to be that way. Get real, Kit. Parents will NEVER stop trying to cage their discards on these plantations. They have the most to gain from perpetrating this cruelty. Not only can they exile the children they’ve abused, but, in addition, they can mercilessly punish those children for causing them “stress”. And none of that carnage will cost these “parents” their $$$$$$ or their social status. The taxpayers foot the bill for it, and the “farm’s” medical license cloaks it under the auspices of “care”. To stop this disaster, it needs to be outlawed as exactly what it is – kidnapping and wrongful imprisonment. Great article. I don’t understand and it “hurts my feelings” if I am told to go and live or work in a place just because of who I am. We should learn from each other. a place where you live where you are not allowed personal freedoms is still a jail, no matter how ‘gussied up’. Whether it is a farm of collected disabled, or a localized institution set apart from everywhere else, its a still a jail. It’s still be determined by someone other than ‘us’ as to what would be ‘good’ for us, how we would choose to live or work. This business of busing in the abled to see the disabled, is nothing short of Ringling Brother’s style of proving that what is being done for “the disabled is for their best” (even though no one ever seems to think, we might have our own agendas, interests or wants in life). My frustration further is the ever growing blogs that are being written by the disabled, without compensation by said blog companies, supposedly to ‘help the disabled’ mostly focused on the non disabled family, because after all, we all are just ‘children’ even if we are above the age of 26. It is our abled bodied family members who are supposed to be our life guardians, supposed to see our financial means for our whole life (and this is a major lie, btw), and know ‘what is best for us’. I think that we have had enough exploitation without compensation, and would like to speak for ourselves where the best place for US to live, might be where we want to be. And no one knows this condition called “the disabled” better than ourselves. At sometime the ‘disabled’ should be calling the shots, not constantly being ‘talked at’ what is best for us.